Here’s the latest update with our luggage that went missing. It flew to Paris via Scandinavian Airlines. I guess it didn’t want to go with us to Sweden. Whatever! As I had mentioned, I had a feeling that they would find it. I was not about to blame WOW Air or the luggage personnel in Iceland. Stuff like this happens all the time. I did report the lost baggage to Chase last night. They filed a baggage delay claim which gives me and Nancy a $200/per day value to purchase any travel essentials (clothing, toiletries, including cell phone cables and chargers). This was a travel protection benefit that I blogged about yesterday, a benefit from our Chase Sapphire Preferred. However, I do have a little lesson-learned from this experience. 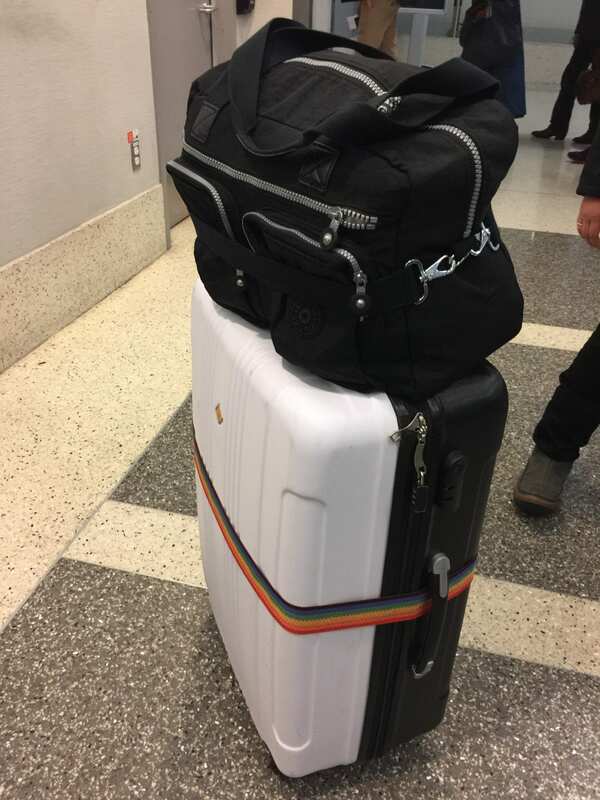 While we had a checked luggage with our scarves, jackets, layers of clothing, socks, pants, and some toiletries, we also had our hand carried items which included our personal documents, basic toiletries, underwear, some shirts/sweaters. So the lesson here is to always make sure to not put everything in your checked luggage. Flight delays or baggage delays or lost baggage issues could happen and you could be left with nothing with you when you need it most. Again, to all the WOW skeptics, let me tell you that WOW Air made sure to keep in touch with me about the lost/delayed baggage. They work with a local luggage company that kept texting me during the day to make arrangements about delivery. However,the local company was making arrangement for us to wait for the luggage using a 4-hour window. I couldn’t wait around since we were on vacation. So, our poor, lost, lonely, jet-setting luggage will be sent directly back to California. Ok…Sweden….let’s talk about Sweden. First of all, from the airport, we bought tickets using a kiosk for Arlanda Express. It’s a train that connected us directly to Stockholm City’s Central Station. It was a non-stop ride. The best part, not only was it a fast 15-20 minute ride, but the train also offered high-speed internet onboard. Yay, Sweden! Once we arrived at Central Station, picture yourself inside NYC’s Penn Station, or Grand Central….it was that crazy packed! We then purchased our SL Cards, the transportation card that got us around via bus, tram, or train. From there, we had to take another train and a tram towards our final stop, Sickla Udde. We hopped off and our AirBNB host’s sister, Gabriella, met us at train stop. She walked with us towards the apartment. A gorgeous one-bedroom apartment, so spacious with a very homey feel. Ironically, the owner was in Los Angeles while we rented his place. We freshened up for a bit, and headed out around 3pm. We went to Old Town. Once we got off the train at Gamla Stan, man, it was the old European feel that I loved – that’s what I saw. It’s exactly what I expected to see in Stockholm. We walked around for a bit, walked towards the Royal Opera House. La Boheme was showing that night, but as expected, it was sold out. We got hungry and found the nearest unassuming kebab place. That was outstanding. Were we just hungry? Maybe! But it was filling, tasty, and delicious! We kept on walking and it was really nice to be walking on some parts of streets that were made up of cobblestones. The little alleys that turn to little surprises. For dinner, we went to Slingerbulten, a local Swedish restaurant. It had very great reviews so we had to check it out. We had their Swedish meatballs…so tasty, and moist! The next day, we started our day by taking the train to get us to Ostermalms Saluhall. I had to try the Swedish Cheese Tart and the Minismorgastarte….so decadent! We kept on strolling and stopped at Fabrique, another local bakery…we had their wonderful walnut pastry and cappuccino to go along with it. Nancy’s friend who visited Stockholm mentioned Kajsas Fisk. Of course, we had to go there. Why? It’s all about the fish soup…..loaded with shrimp, mussels, chunky fish, topped with a glob of garlic aioli. This was uber delicious!! Best part, it was all you can eat for only $10. I also ordered Frutti di Mare….another excellent lunch. The rest of the afternoon was dedicated to walking around the museum area of Stockholm. We visited Vasa Museum. The star here was the Vasa ship that sank in 1628 during its maiden voyage. Three hundred years later, the ship was found and salvaged, and was restored back to its glory. The price of the admission was around $13 per person. We also walked towards the Abba Museum, but it was already late in the day when we got there around 4:30. The museum closes at 5pm. We just took pictures right outside the museum. We stopped by a local gem, Vete-Katten, for their pastries and coffee. What a gem indeed. Once you enter, you’d find the bakery section, and where they serve you the coffee and sandwiches. But you can walk further and find yourself in different corners and turns of this restaurant. For dinner, we took a bus towards Odenplan and found ourselves having dinner at Ramen Kimama. Ramen was redeemed after having just an “okay” ramen experience in Iceland. We ordered the Shoyu Ramen and their fried rice. Very good!!! That was our 2nd day in Sweden….over 18,000 steps, said Fitbit. More tomorrow! Enjoyed your post and your photos! Hoping you will enjoy your time even though your luggage is going back home. Were you able to replace the necessities with your Chase “credit”. Hi, there. We were able to purchase a few things here and there, got them as needed. Just woke up, and today, it’s snowing. Looks like you had a great time in Sweden! !